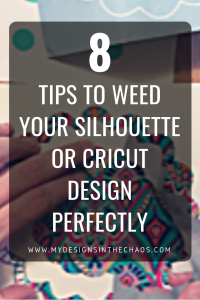 Once your design is cut the very first thing that every crafter must do is weed their design. (unsure about what weeding means… then head back to this post first) Sometimes things weed perfectly and other times the vinyl ends up in a giant ball for the trash. 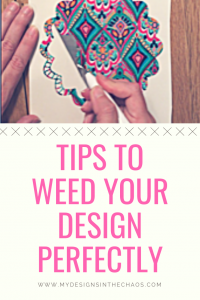 Today I want to share with you several tips to help make your life so much easier when you weed your next design. Have a nice set of weeding tools. They don’t have to be the official Silhouette or Cricut tools but as long as they are sharp and pointy they will work. This dental set works great and it is essential to make sure that you have a pair of pointed tweezers. But just in case you don’t have an ‘official’ weeding tool handy… A seam ripper can work wonders. When weeding use a head lamp. It’s hands free, cheap, and gives tons of light which makes the process about a million times easier. Have a place to put the scraps that you are weeding out of your design. I love to use this nail polish bottle holder (I like to call it my weeding ring) but scotch tape will also work. Use a light pad from the underneath. Once the design is weeded you can place the vinyl piece on the light pad to see the cut lines much more clearly. This especially works great when weeding glitter vinyl. This tip might sound a little strange but it works… sprinkle a little bit of baby powder in the creases of your cut lines. The powder will settle in the cracks and doing that will help you to see where the lines are to weed. They will be much more pronounced and therefore you don’t have to worry about missing a section. Like the tip above, this also works especially well with glitter vinyl. Add a weeding box around your design or even weeding lines. (future blog post with more details on this coming soon) Adding these boxes and lines will make it easier to weed your design in sections and will also help you save vinyl. Tape a note card to the outside of your cutting machine and write down which settings work (for you) for each medium that you cut. This will save time (and your frustration) in the future when working and switching between a variety of materials and projects. When you have the perfect cut the first time your weeding time becomes sooo much easier. If you have cut something super small then make sure to try out reverse weeding. 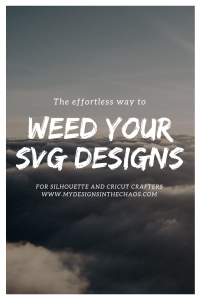 Check out all the details on how to reverse weed a design here. Finally, if nothing else seems to be working, make sure that you are using quality vinyl. That really does make such a difference in the ease of your projects. My favorite vinyl to use is here. It weeds like butter EVERY. SINGLE. TIME. 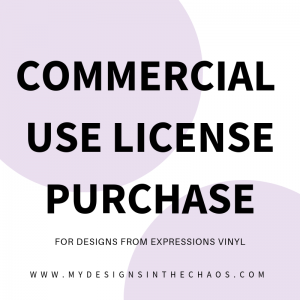 Also check out more details on the various types of vinyl here. Using all the tips above you will be weeding like a pro in no time. As always we love to see your finished projects. Share them below or over in our FB group and don’t forget to pin these tips for future reference and share them with a friend… Because real crafty friends don’t let other crafty friends suffer through weeding vinyl. DISCLAIMER: When shopping through the links above we earn a small percentage at no extra cost to you. All opinions are 100% our own.